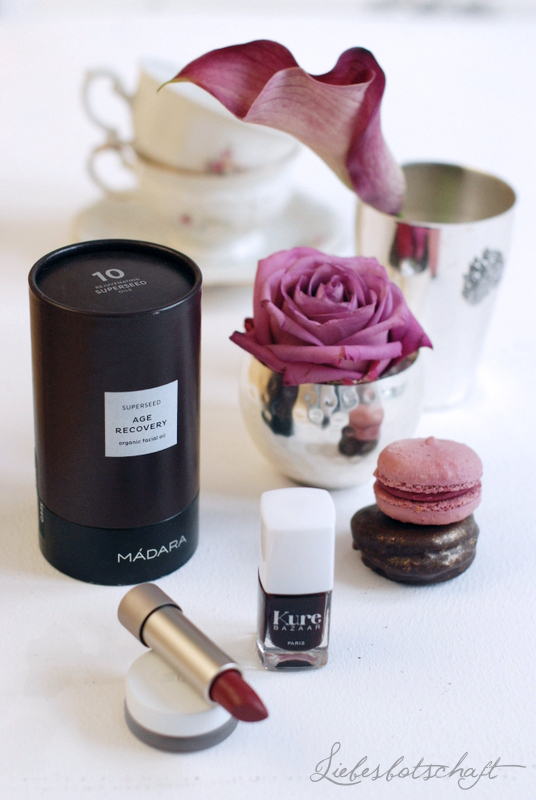 Liebesbotschaft International: Chocolate+berry: my January beauty favorites. 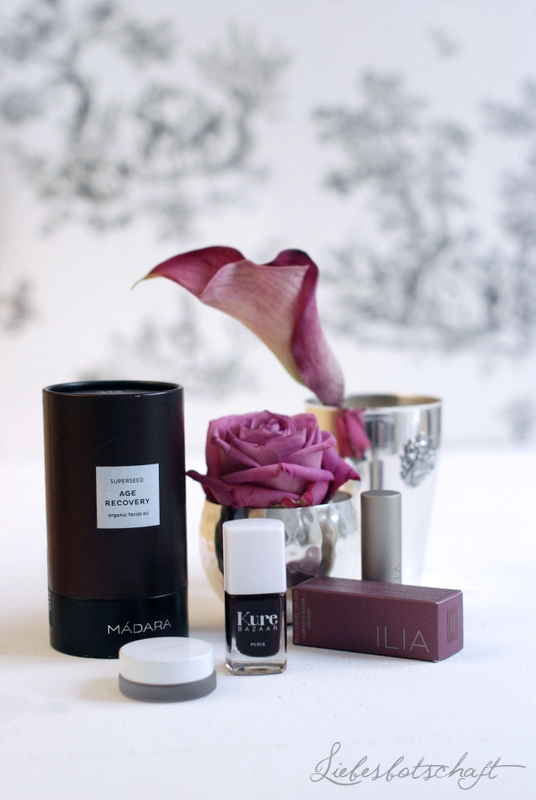 Chocolate+berry: my January beauty favorites. There are simply too many fantastic things that work without any chemically produced active ingredients. These are true treasures in the area of natural beauty, which have long turned into real lifestyle icons – all the while being beneficial for your skin and the environment. As much as I love the cold months, skin quickly tends to look sallow and lifeless without sunshine, cold wind makes you pale and dries out everything. So I’d rather side with the snow queen look than the snowman look ;). And you don’t have to dig deep into your cream jar: natural hues for the cheeks and more intensive ones on the lips are all you need. But not every color is made equal, not every product is suitable to last through the winter surviving the ice-cold air. In order for skin to absorb make-up well, it has to be supploied with an ideal amount of moisture. Once temperatures are dropping the regular moisturizer will usually not be adequate anymore – resulting in a feeling of tightness after cleansing and dry patches. Immediate relief comes in the shape of an oil/serum combination – Jil’s huge enthusiasm for oils completely won me over. 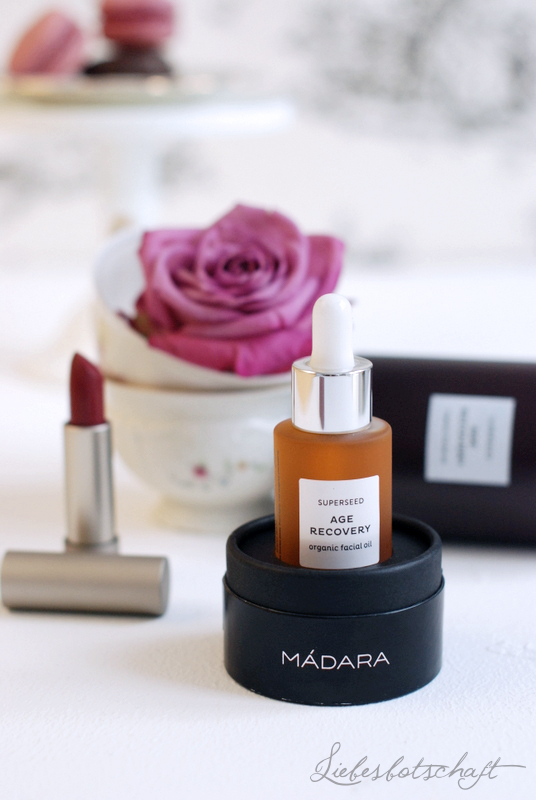 My oil is by Madara, just a few drops are enough to pamper the skin with everything it needs, especially now. Rich, absolutely natural ingredients ensure good tolerance and support the anti-ageing effect. Apply your regular moisturizer on top and you’ll have the ideal basis for your day-time make-up. By the way the oil is delivered in classy chocolatey-brown packaging – and is available for all kinds of skin types. Important thing to look out for in all beauty products: make sure they have a high moisture content. 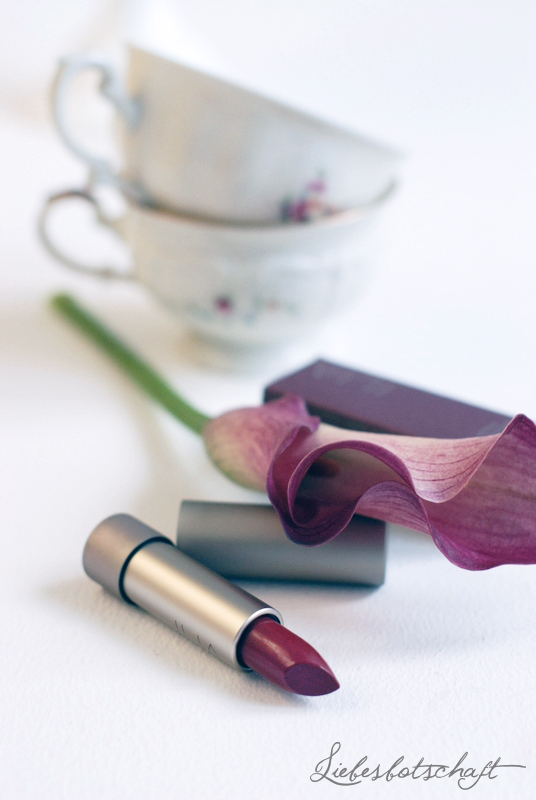 Many lipsticks dry out after being exposed to cold air for a few minutes and start flaking. 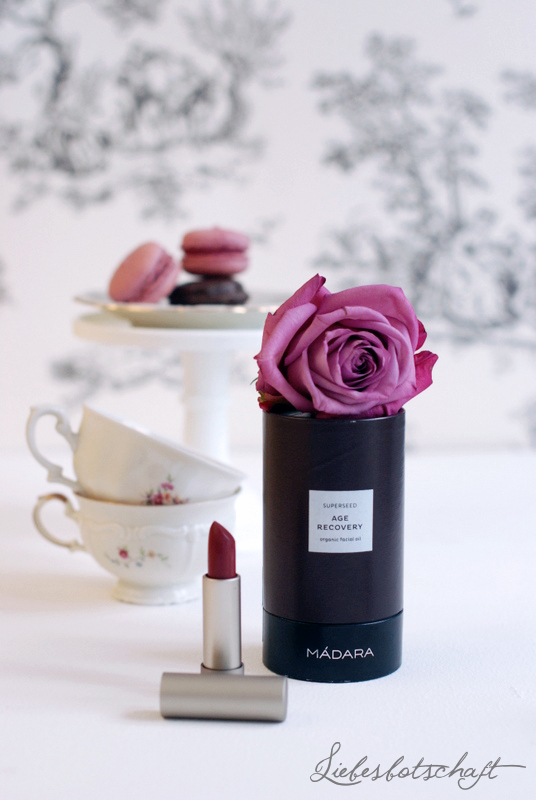 Generally I love dark berry hues and I wore the color Femme Fatale a lot during the month of January. Anyone, who would like to try wearing red on their lips, but finds the classic red a little too garish Femme Fatale is a great alternative; the berry color is a rather dark red. 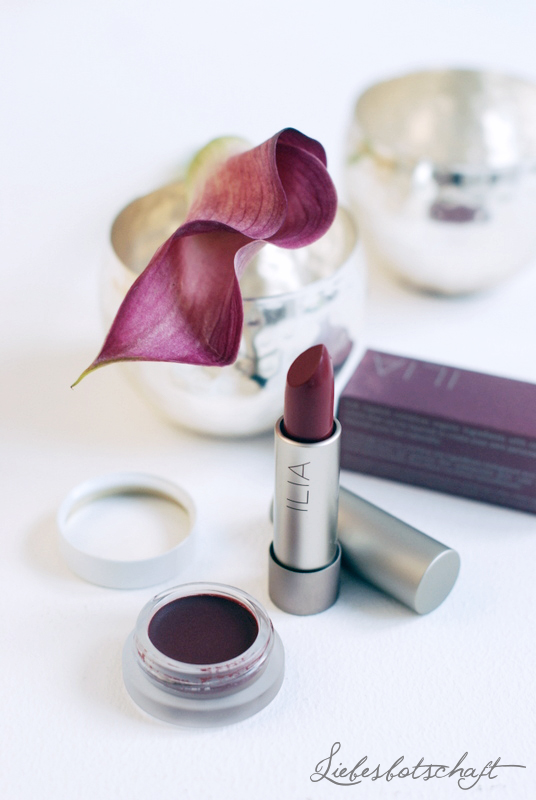 The lipsticks by Ilia are all slightly matte and have an extended staying power. Apart from that they nourish winter lips with cocoa butter and jojoba oil. The simplest formula to fight the winter blues is colorful nails. Kure BAZAAR is one of the few labels that reduces the use of chemical ingredients to a minimum without the nail polish’s quality being jeopardized. Pulp, grains, cotton and corn aid them through the cold spells and have the effect of a winter spa treatment. Be sure to order the best nail polish remover in the world at the same time, without any chemical additives and featuring a pleasant smell! 4. Blush for lips and cheeks. If you are in a hurry in the morning, a multi-tasking product like the RMS lip2cheek color is a real life-saver: small jar – great applications. The burgundy color can be applied to lips and cheeks quite simply with your fingers, the warmth of your skin melts the product just enough to be able to blend it perfectly. The finished look is surprisingly delicate and natural-looking, only after adding several layers the color looks more intensive. The creamy consistency does not dry out skin or settles as do some powder blushes. Dabbing the color onto your lips makes them look delicately blushed, as if just returning after a walk – don’t let the dark color fool you. Great for everyone who loves an un-made-up look, but still would like to add a little freshness. Raspberry and chocolate maccarons for the skin, so to speak! This post was translated by Ginnell Studio. Don´t use my pictures without permission. Crush on silver in February. The 10 best ideas for Valentine’s Day. In a Monday spring mood. 10 tips for a week-end in February! Comfort food + SWAT team. Bye-bye January - hello February!